Protecting a patient’s personal health information from privacy breach, charging honestly for the care provided, and auditing the compliance of practice or facility all rank very high in healthcare. Being very dynamic, that is changing at a fast pace, healthcare compliance consulting can become a headache for healthcare providers if handled carelessly. Despite being a challenge, if compaies can ensure compliance, the quality of healthcare is greatly improved. It can standardize how patients and everything associated with them is treated. Additionally, it not only helps the patients feel more secure about their personal details, but it also ensures that the right information is available to the right people. The volume and complexity of the compliance, which includes patient care, billing, reimbursement, managed care contracting, OSHA, Joint Commission on Accreditation of Healthcare Organizations, and HIPAA privacy and security to name a few, healthcare companies are forced to rely on specialists to comply with all the sets of laws and regulations. The specialists can ensure that healthcare companies do not get into trouble with the government by finding flaws before a government agency does it. As a result, the companies are not faced with problems regarding the imposition of sanctions or financial penalties. Uncertainty, complexity, and limited time or resources are some of the biggest problems faced by healthcare companies when it comes to compliance. Choosing the right healthcare compliance consulting consulting/service provider not only enhances the financial well-being but also ensures that better care is delivered. Taking these factors into consideration, a distinguished selection panel comprising CEOs, CIOs, VCs, and the Healthcare Tech Outlook’s editorial board has selected a list of the top healthcare compliance consulting companies. These companies offer powerful solutions coupled with innovative strategies that are distinctively prominent in the field. CynergiesTek, Inc. provides an array of specialized consulting services that help healthcare organizations to achieve their privacy, security, compliance, and document output goals. It is a top-ranked healthcare compliance consulting company which is serving the information requirements of the healthcare sector. CynergisTek offers a series of solutions which help companies to verify and validate privacy and security programs that meet compliance and business objectives, and hence, allows organizations to get prepared for audits and investigations. The compliance services delivered by the experts of the company provide an overall assessment for an organization’s audit readiness. CynergiesTek realizes the regulatory and compliance environment and accordingly assists organizations to improve their risk management efforts. The company has partnered with hundreds of healthcare organizations and educating and has been assisting the industry since 2004. Cytek is a leading healthcare compliance consulting company that offers cybersecurity and compliance for small and medium business which proactively stops and detects the execution of evolving threats and malware. The technology of the company is positioned in over four million endpoints and protects hundreds of companies around the globe including government organizations. Cytek helps small and medium-sized companies which cannot afford to pay a huge amount for enterprise-level cybersecurity with the same problems as big firms, by providing them enterprise level security within their budget. Cytek is creating a new path and redefining the means of security by preventing advanced threats and malware from causing harm across the globe. Cytek Consulting delivers best practices for prevention, patch management, vulnerability, network architecture, and assessment of both internal hosts and external services which hackers usually use to gain a foothold. Cytek protects and prevents it from further exposure by permanently eliminating the vulnerability. 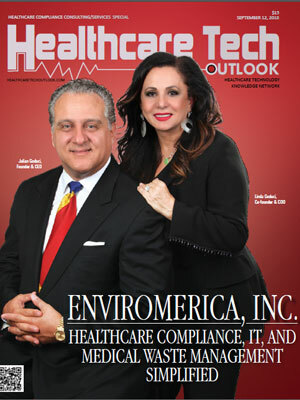 EnviroMerica simplifies compliance, IT, and waste management for healthcare. The healthcare compliance consulting company realizes the need for eliminating the complexity of medical waste management while complying with the most recent regulations. The company operates from integrity, excellence, and convenience as a value-based company and not only keeps the businesses safe but also the environment by ensuring the safe, environmentally-friendly disposal of medical service byproducts. EnviroMerica supports both small and large companies by educating them about biohazards, making disposal and pickups convenient and simple and hence protecting the environment. The company has a long history of building a better relationship with its clients and was awarded by the California Medical Association (CMA) for serving as an exclusive approved associate of choice for waste management and regulatory compliance. PCIHIPAA is a leading player in healthcare compliance consulting landscape, streamlining the HIPAA and PCI compliance with private and dental practices. It provides quick and convenient compliance solutions for dentists and doctors by removing the complexities and burden of financial and legal compliance to PCI and HIPAA regulations by delivering primary security products and insurance to mitigate the liabilities facing by their clients. Compliance is crucial and needed by law in the medical field, and there are the highest security levels established by PCI to secure the information of cardholders. Every medical professional has to stick to PCI standards whether they are part of a multi-physician organization or solo practitioner. The company provides services such as PCI certification, data breach, and PCI insurance, compliant data backup, email encryption, and incident response planning and training. Acentec, Inc. provides services to the medical outpatient community. The company has designed all the solutions to focus on the quality of care as well as taking care of administration, rules or any other distraction. By focusing on doctors’ results, they are able to meet their customers’ demands beyond their expectations. The healthcare compliance consulting company offers IT healthcare management, medical billing, thePogoMD certified patient portal, and HIPAA Security Suite which is the one source solution for a full, meaningful application that qualifies HIPAA compliance. The HIPAA Security Suite (HSS) is one of the leading industry solutions for HIPAA compliance. HSS is a lone solution in the market solution for HIPAA compliance that provides a comprehensive risk assessment according to NIST guidelines, a thorough analysis of their technical infrastructure, complete set of legally revised and updated policy and procedure, and employee HIPAA privacy and security training. The consulting staff of Acevedo is recognized nationally for their expertise. In contrast to many of their competitors, AAPC, Health Care Compliance Association, and AHIMA are their consultants. They are certified in many fields, including Coding Instructor (CPC-I), Medical Auditing (CPMA), E&M Coding (CEMC), and Medical Risk Adjustment (CRC). Moreover, the majority of their consultants through the Health Care Compliance Association are certified in compliance with healthcare requirements. During the review process, Acevedo Consulting acknowledges its team's access to patient and proprietary information that must be protected from incorrect communication. In considering the trust placed in it, Acevedo’s healthcare compliance consulting agrees that the firm will not use any information in its own interest or divulge, communicate in any way at any time, directly or indirectly in any manner. Hayes is helping organizations witness a healthcare landscape that is changing. Their goal at Hayes is to help them build a solid foundation of integrity within their organization. The healthcare compliance consulting company has been partnering with the country's largest organizations for over 25 years in order to improve revenue, reduce risk, and simplify operations in order to help successfully address the growing healthcare environment. MDaudit enterprise, the flagship revenue integrity software platform allows organizations, all within a single, integrated cloud-based platform, to reduce compliance risks, enhance efficiency, and retain more of their revenue streams by providing workflow automation. One out of eight U.S. suppliers is audited with MDaudit. Healthicity is based on a single idea founded by AAPC to simplify the functioning of their enterprise. They develop solutions to audit, comply, and analyze simple and intuitive experiences that increase operational performance. They are designed to simplify the lives of healthcare professionals, including doctors' groups, ACOs, qualified nursing facilities, hospitals, and payment agencies. The healthcare compliance consulting company provides solutions that make working life easier for customers. They mitigate the complexity and design solutions to make them work smarter. These solutions are not only easy to use, but they also have educational tools to maintain their leading position in the classroom. The company and its team scales their their ability to address those challenges by changing their approaches. Nova Consulting & Compliance LLC is a Hall Render company, a leading health law firm in the country. This unique organizational structure guarantees access to accurate and updated compliance services and advice for Nova's clients. The Nova team is multi-faceted and collaborates regularly with a large number of providers across the country on a wide range of compliance issues. Nova has team members who regularly help customers develop or improve their internal compliance practices in their respective programmes. For many healthcare providers, hospitals and healthcare systems, from large multi-hospital systems to independent agencies and providers to rural critical access hospitals, Nova worked toward compliance issues. Nova Consulting & Compliance offers customers across the country a full range of advisory services. The healthcare compliance consulting company operates, implements procedures, and support compliance solutions as trusted partners. They aim to identify problems and prevent compliance issues for their customers. Validant ensures safe and reliable access to healthcare products that save lives around the world. As the leading quality, healthcare compliance and regulatory consulting firm, the company combines industry expertise and innovation in order to provide customized solutions for healthcare companies. The Validant network is the largest group of leading engineers, scientists, clinicians, and field specialists. The healthcare compliance consulting company manages the complexity in the healthcare industry through their profound experience working with the FDA and several other health authorities. They can handle any level of the project seamlessly, integrate them with their team to ensure that the products are delivered as soon as possible to the people who need them most. They have earned the trust of 20 of the world’s 30 largest pharmaceutical companies, 25 out of the top thirty healthcare providers, and 7 out of the top ten biotech companies.